Last month, the Indianapolis 500 announced Donald Trump would drive the pace car during its 100th anniversary later this month. Now several groups are advocating Trump should get bumped thanks to his political attacks. Here's why he still should drive. From reviving the ridiculous conspiracy theory that President Barack Obama wasn't born in the United States to questioning whether Obama deserved to get into Harvard or imparting much-needed life wisdom into Gary Busey, Trump has managed to spend the month ginning up controversy ahead of a possible presidential run. It's the kind of hot political spotlight that's also drawn charges of racism, sexism and questions of his true net worth. I have no problem if Trump disklikes President Obama or his policies. But to step over the line into the realm of conspiracy-mongering is not good for politics or for America. And it should not be rewarded with the honor of driving the pace car at the Indianapolis 500. The Indianpolis Motor Speedway — which dubbed Trump a "global business icon" upon announcing him as the pace car driver — told the Indianapolis Star the complaints were "on the radar," but that it had also received messages backing Trump. The spokesman for the track also said the decision to give Trump the honor was made not just by the track, but the race's major sponsors, including Chevrolet and Izod — giving the protesters a direction to channel some of their anger, just as Groupon pulled its ads from "Celebrity Apprentice" following Trump's birtherism babbling. 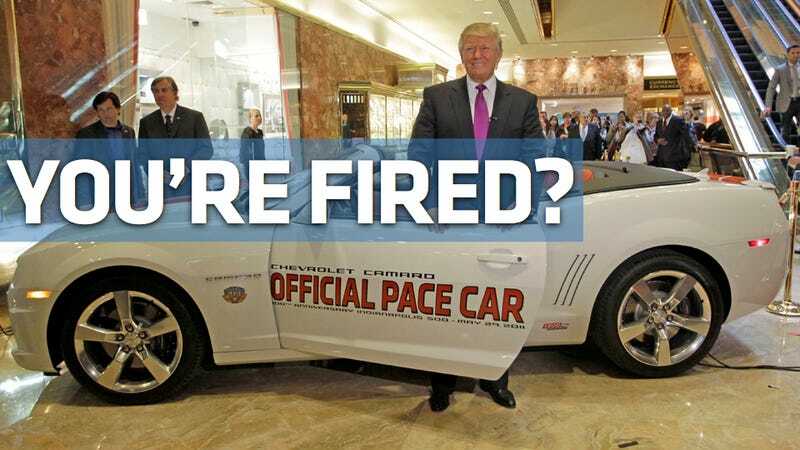 Having Donald Trump on the receiving end of "you're fired" might be a cathartic moment for many people, and his presence behind the wheel of the pace car does give the Indianapolis 500 far more controversy than its typical celebrity lineup of Florence Henderson and Jim Nabors. But maybe he should keep the gig. Trump's true business isn't real estate or gambling or television, but attention. In one month, Trump has gone from dark horse candidate to laughingstock, so hearing the unfiltered feelings of a few hundred thousand Americans could be more punishment than prize. And for those of us who can't make it in person, we'd get to see what a convertible driving at 80 mph does to his hair. Sometimes it's better to give publicity hounds not just what they want, but what they deserve.